Mrs Doreen Lubricant has invested a considerable amount of her own money on an outlandish scheme to make the coastline of Great Britain 'less jaggedy'. 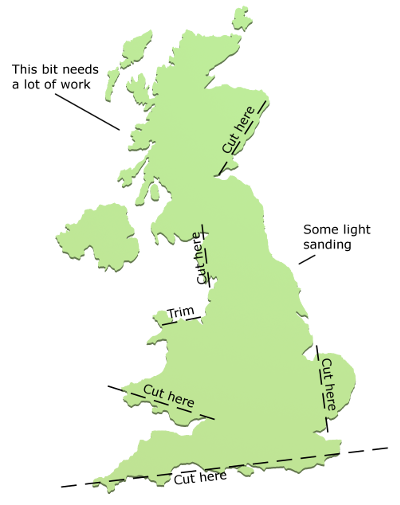 "You take a good look at any map of Britain," she explains, "and it becomes painfully obvious what the real problem with this country is: the edges of it are all ragged. You've got bits jutting out here and there, and great big bulges all over the place. "It looks a proper sight, I must say. What visitors think of us when they come over here, I don't know. No wonder we have slipped so far in the estimation of the rest of the world when we can't even keep our own coastline tidy." To rectify this situation, Mrs Lubricant is searching for as many volunteers as possible to join her in a vigorous campaign of sanding and planing, with the eventual aim of making Britain's coastline smoother and more streamlined. She has also written to the government in the hope of enlisting official backing for her project, but so far the response has been lukewarm. "Whilst we always make the effort to be sensitive to individual concerns," said David Contour, government spokesman for geography, "in this particular case we can't avoid coming to the conclusion that this woman is an absolute basket case. "As I understand it, Mrs Lubricant's efforts to smooth down the coastline have already resulted in instances of criminal damage to private property. And, whilst I am sympathetic to her claims that 'some of the pointy bits are a danger to shipping', I'm afraid the government cannot condone the wilful destruction of the environment. "Quite frankly, the woman is a menace, her ideas are ludicrous and the only thing that commends her bizarre and unnatural scheme is that it would involve the almost total eradication of East Anglia."